Unlike my father and sister Alex, I have never been a great fan of kitchen gadgets and living in the confined space of Cribs has made me even less so. What I have on board seems to do everything I need. I don't have any electrically powered kitchen aids either. This is mostly by choice but also when I have tried them they usually succumb to the variability of my home made electric supply and let out the blue smoke that we all know electricity is made from. I have dad's Sabbatier now but the main thing is for the blade to be sharp and rigid. I don't own a small knife other than my Swiss army knife. I still prefer wood as I think it is kinder to my knife than the hygienic plastic ones. I bought the current one in Cargo. Its beaters are made of round wire which are easier to clean and do a better job than the flat ones. It has a geared handle and whizzes quite fast. This is the Moulinex type with a rotating drum and a handle to press the cheese against it. The drum can be put in from either side so is a perfect tool for the left-handed. Rosemary, who is left handed and who gave this to me, remains unconvinced that she could use it. I especially like the latter for stirring stir fries, browning meat etc AND serving spaghetti and other sauces. The use of this for this application used to particularly annoy Carol who could never see how a flat object could be used to deliver a liquid sauce to the pasta. [She who could pick up a grain of rice with a chopstick!] Of course the spatula acts as a selector and used in this way the sauce that makes it to your plate is not as runny as that left in the pan. This is essential for turning homefries, omelettes and pancakes, it needs to be sharp and wide. I also have a ladle which I regard as a bit of a luxury as a mug works almost as well. For grinding spices, chick peas etc. I've tried various potato mashers in the past but prefer a large fork. One especially annoying one had a handy metal loop built into its handle so it could be hung up. This also ensured that you damaged the palm of your hand every time you used it. It was snatched up from the laundry when I banished it there by some masochistic boater cook. I've had several of these too and regard it as an essential. The one I have now is the best I have ever had. It has large strong handles and turns back on itself so that the bits that don't go through the holes are pushed out making it easy to clean. I usually include this bit in the cooking as well. I have broken several that were not sturdy enough and one knife when I used the side of the blade to crush the clove. Now I have had this items for years without feeling any sort of foodie guilt whenever I use it. Apparently, I have it all wrong!!! Check this link for garlic press angst. 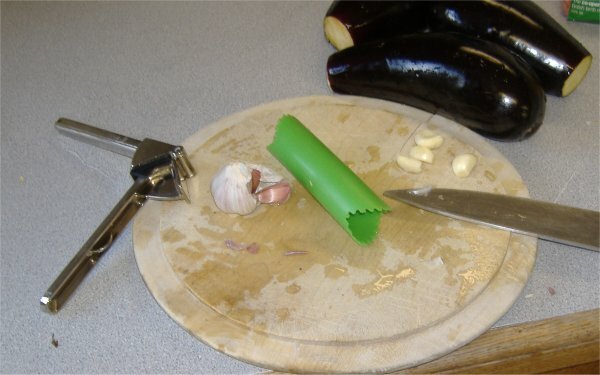 Its wonderful that anyone can get this worked up about something as simple as a garlic press! Recently, I've discovered the gadget below for peeling garlic, now expect to see diatribes about its use, but I have found it to be very effective. You drop the cloves into the tube and roll it between your hands and the skins fall off. No doubt they are slightly traumatised by the experience but some gentle counselling before you crush them in the press usually makes them feel alright again. I've been through several of these too and don't think I have got the ideal one yet. They are essential for the production of vitamin drinks to keep shipboard scurvy at bay. I'm still using a large aluminium pan that Donato gave me as a wedding present in 1968. Its size is ideal for marmalade, spaghetti sauce and boiling pasta. I use it a lot but not for chutney. In some ways the perfect multi-purpose utensil. It hangs out of the way by the stove and is great when I have large numbers to cater for. I use these for pizzas. I know that metal is probably better but this is what I have and they don't rust. I have two, a big one for pastry and bread dough and a smaller one for whipping egg whites. Like nail clippers, good potato peelers can only be bought in America. I like the sort with a swivelling peeler blade, my current one has a fancy handle and a very sharp blade. Contrary to popular belief, I do have a measuring jug, its Pyrex and has metric and imperial measures on it, it belonged to my mother. It is also quite useful for filling the radiator. As you already know, or have found out from reading this website, I'm not a great one for measuring things but I know that others are. So I have been trying to put measurements in, retrospectively and in new recipes as I add them. This of course presents all sorts of problems as to which measuring system to use. Now as far as I am concerned I would be very happy to just use metric and that would be the end of it. Problem is that I have lived in the United States and some of my recipes originated there, where volume measurements are used for most things, American cooks don't even own a pair of scales. Of course, little old man that I am, I only have an old fashioned pair, and these I acquired from the laundry room at Poplar Dock. They were enamelled white when I got them, I suspect they had been used for weighing babies, or something else medical. I have re-painted them in maroon, and of course I'm still using their imperial weights. I am fairly adept at converting between units, and I'm very suspicious of recipes where the imperial measures have been exactly converted to metric and vice versa. What is usually more important is the ratio of ingredients and not their absolute size. Of course what I would do in practice here is to take a 250g block of butter from the fridge, cut it in half, or a bit less if I really did want 4oz, and then use it as the reference weight to measure out 2 lots of flour. I have several American recipes and these notes are meant to be helpful in interpreting them for the UK. American recipes use volume measurements. Usually, these are easy, but be careful! That which is called a tablespoon in the US, is called a dessert spoon in the UK. A UK tablespoon in America is called a serving spoon, or just a spoon. Syrup in the UK is much thicker than the commodity called syrup in the US. I replace the syrup in american recipes with english syrup diluted with its same volume of water. ie use half the volume and add an equal volume of water. Use unsweetened cocoa powder and butter as an alternative to 'Baker's' chocolate in US recipes. 1 cup is 8oz of butter.